You may recall the free RitzPix Today Show Valentine’s Day photo book deal that I wrote about back in January. I did print out some 4 x 4 mini books in last year with RitzPix, but prior to that my only experience with the company (which I knew as Wolf Camera then) was with photo printing – back in the day when I still printed photos. I preferred their photo printing much more to my local drugstore photo finishing, so I was interested to see how the quality of their books compared. What I liked was the quick turnaround and the option to pick up my book in-store. Enough of my movie review, now back to our photo book review. RitzPix’s software is online, so you can work on your book from any computer, after you’ve uploaded the photos to your online account. The upload took quite some time so getting to work on the book was not a quick start. I had about 120 photos that I wanted to select averaging 2 to 3.5MB per photo. It took about 3 hours to upload, (we have AT&T DSL Pro with an upgraded upload speed of about 512 Kbps, but I am using the wireless connection, so that should be taken into account – I can also plug in directly to take full advantage of the speed). Whenever I see any uploading taking a while, I let it run and often just go to sleep. On the flip side, since you’ve already uploaded your photos, the checkout process goes through quickly. If I could choose however, I would prefer a quick start and then longer upload upon checkout. Here’s more information about RitzPix’s software and products from our database. Did you know that we have specs on every photo book company in our database (now at 29 companies and counting?) You can find them all on our main Photo Book Reviews page. After uploading your photos, you go to the photo book section of the site to select what type of book you want to make. The promo book was the 1-hour entry level hardcover book. I chose the black linen keyhole cover, which gives you a cutout on the cover to reveal the photo you selected for your first page. From there you are required to choose a theme, which I don’t normally like to do since I like to make my books from scratch, but I figured out from clicking around that the “Classic” category contained the plain background themes and I chose plain black. From here you go to selecting your photos that you’ve already uploaded. 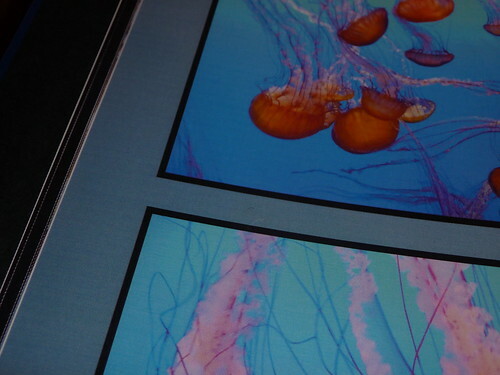 The software tells you that a photo book begins with 20 pages and that you need to choose between 29 and 68 photos. I found this a bit unusual as I wonder why there would be a limit if you can design your own layouts. If you add less than the required photos, a window pops up to ask if you want to continue since you may have blank pages, so it actually doesn’t prevent you from continuing. You can add more photos at any time. Selecting your photos for your book in RitzPix. With a click of a button, the program automatically places your photos and then allows you to add text, but if you want to change the layout, you have to click on “Customize” which brings up options for backgrounds, clip art, and borders. Interestingly, there are no templates to choose from. You cannot save your templates. The workspace is also a bit small which makes viewing the details of the book a bit difficult. You definitely want to use your full screen mode which you can access from your browser menu. I know there’s also a function key as well, within the program to do the same, but I couldn’t find it when I looked. It would also be helfpul if you could view one page at a time, so you could get a larger full page view on the screen. The software is not as intuitive as other photo book software I’ve tried. When you want to make edits, a menu pops up requiring you to click on a “tool” before you can execute that action. Resizing for instance isn’t done by clicking onto a corner and dragging. You first have to click on “Resize” and then cursors pop up which you drag to increase or reduce the size. A big limitation is there’s no measurements to guide you, so if you wanted to make two photos the same size, you would have to do that by eye. Also, one of my favorite tools – the “duplicate” button was no where to be found. A duplicate button would have been especially helpful here given the lack of dimensions for the photo boxes. That way you know for sure that you’ve created two identical boxes when you’re doing layouts. It was helpful however that the software tells you whether your photo will print well in terms of size and resolution. The software tells you whether your photo is of acceptable quality for print. See top left photo. 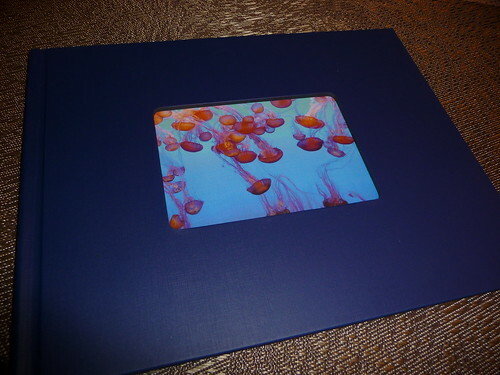 As with all other photo book programs, I recommend that you edit your photos in external software before uploading rather on relying on the photo book company’s editing tools. You can only zoom, pan and adjust opacity of a photo within the program. In comparison with companies that only offer fixed templates like Shutterfly and Snapfish, RitzPix is better in allowing for customization, but if you’re specifically looking for a company that offers customizable layouts, I find RitzPix’s software pretty limited and a bit clunky, in comparison to Blurb, Photobook America and Picaboo. So, while I consider the main division between photo book companies to be those that offer fixed layouts versus customizable layouts, there are major differences within the categories themselves, as to the level and ease of customization. I liked the fact that the book was ready for pickup the day after I ordered it and I liked that I could pick it up from my local RitzPix’s store. When I went in to pick up my book, I was greeted by a nice salesperson with a Bieberesque haircut. He had some bad news for me – they ran out of black linen covers so they did their best and chose the next best complementary color which they thought was the navy blue. That wasn’t a big deal to me since the book was practically free and it did look okay. The odd thing is that the book cover doesn’t feel like linen, it’s more like a plastic with a linen texture. It’s a bit hard to describe, but it doesn’t feel like a cloth linen. 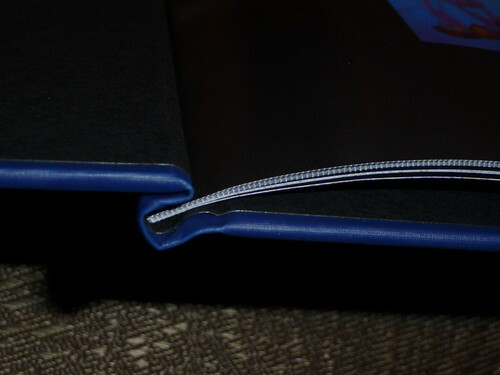 Also the binding doesn’t feel of good quality – it’s just glued in and doesn’t look very professional. You cannot title the spine of this particular product. I paid for my book and my husband and I went to meet some friends for a quick bite at Chipotle which was right down the street. I brought the book in with me, as I love to get my friends’ opinions on the photo books – it helps to have the perspective of folks who aren’t living and breathing photo books on a daily basis. Unfortunately, things just kept getting worse from there. Arghhh – tell me why does the book have perforated pages! A view of the binding and perforated edges. Since the one-hour books are printed on site at each local store, I guess they have some limitations, but this is not an acceptable one. The paper was of good weight (I couldn’t find the actual paper stats on the site), and I’d say not too matte or too glossy, but somewhere in between. But the perforated pages just killed it. The print quality was also disappointing. There was significant banding/streaking throughout. The color was very uneven. The photos did not print clearly and some colors were completely off. There seemed to be a dull wash over all the colors which given my subject, should have been vibrant. 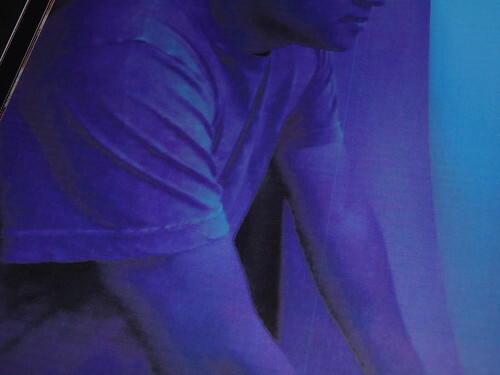 The uneven color and banding on the page is particularly noticeable on the left. Granted I had a few tricky photos in there, but the print quality was poor overall. In particular I look at the photos I’ve taken of people to judge print quality. Our faces were not crisp. Notice the vertical line that cuts through the photo. Although RitzPix allows you to customize your layouts, there are limitations. Some helpful features such as box dimensions and a duplicate tool are missing and the interface is a bit clunky and that could be overlooked if the end result were better. Book quality is not up to par with other photo book companies and the perforated pages are a disappointment. While one-hour availability and in-store pick-up are great features, they unfortunately don’t make up for a poor quality book. Given that it was a promo and less than $7.00, I didn’t ask for a reprint. Besides, nothing would change the odd perforated pages. This review is of RitzPix’s one-hour hardcover book. There is a premium book and premium lay flat book which are not one-hour options, so those books would hopefully print out better, but I don’t have firsthand experience so I can’t say for sure. Did you take advantage of the Today Show Valentine’s Day promo? Share your thoughts on your book below. It’s good to be able to try new companies with a Groupon or other promo deal as that gives a good opportunity to try at little or no monetary risk. So, at a minimum, we got to check it out! I think it will be interesting to see what new changes they have in store. I have a credit and Ritz and am working on a photo album. I can’t figure out how to move pictures from one page to another. It seems as if I am stuck with the picture on that particular page. I can’t even move off the page. Replacing it seems the only option. Ritz support is closed today so I thought I would ask you….Thanks. Sorry Deborah – I made my Ritz book years ago and haven’t done another since. I don’t recall – hope you got someone from Ritz to help! Regards!